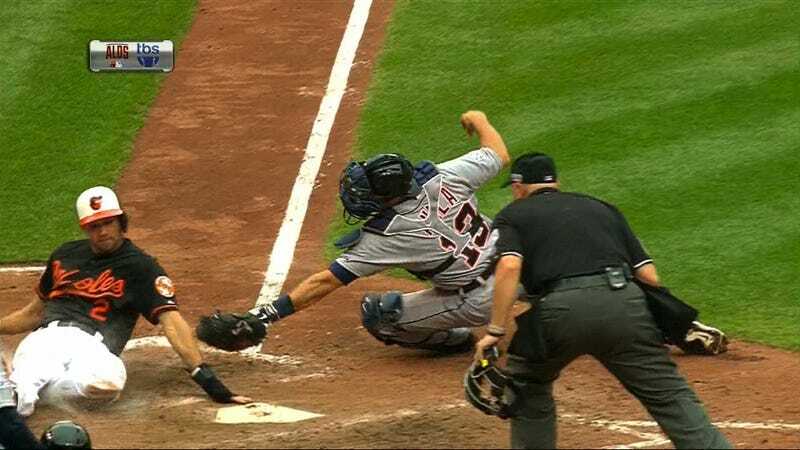 This here is Baltimore Orioles shortstop J.J. Hardy eluding Tigers catcher Alex Avila—by, hell, an inch?—to give the Orioles a 7-6 lead in the bottom of the eighth. Hardy was the third run to score on Delmon Young's pinch-hit, bases-clearing double. Motherfucking Delmon Young, man. That guy has been better at assaulting and berating Jewish people than he has been at baseball for some time now, but he keeps showing up during the postseason and doing stuff like this. He's done it for the Tigers, and now he's out here doing it for the Orioles. We will never be rid of Delmon Young. Detroit was cruising in this game, getting seven solid innings out of Justin Verlander and Anibal Sanchez, before Joba Chamberlain and Joba Chamberlain's insane-person beard came on to protect a 6-3 lead in the eighth and shot everything to hell. Down 0-2, the Tigers will likely send David Price to the mound to try and stave off elimination on Sunday. They should strongly consider not using Joba Chamberlain in that game.